Garmin Circular 7 Pin PC Interface Cable (010-10150-00) €43.00 - buy online at mysatnav.ie - Ireland's leading GPS & Sat Nav store. This PC interface cable allows you to connect your GPS to your PC to download routes and waypoints. 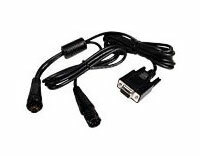 The cable features a standard RS323 serial plug and two circular 7 pin ends. This cable does not provide power for your chartplotter so you require either the cigarette lighter adapter (010-10077-00) or the power/data cable (010-10083-00).